huang17, Anon421, mariobros2 and 3 others like this. No idea what to use for bridges... Needs some other changes too, but no idea what. huang17, Anon421, FCx and 3 others like this. Well, even if it's not complete yet, it already looks good! The map and theme skins still confuse me. I'd like to make a request though. I'd love to see a "Classic Mario" theme. Basically, what if SMB combined the appearance of previous Mario games. Combining all the 8-bit Donkey Kongs with the original Mario Bros and Wrecking Crew would be interesting to see. The blue pipe is based off of the oil can in the first level of the arcade DK, the star is actually a DK enemy, and there's DK Jr sprites as well. This was for an old version of sonic boll, so I'm not sure if it still works or not. Like I said though, it's a work in progress. Mitewing and Thunder Wing like this. Anon421, Thunder Wing, Draken and 5 others like this. Theme skins can actually be more elaborate than just four different themes. My Zelda II theme was 16 or 17 different themes on a single sheet. The sheet posted in the templates is just an example. Oh. Thank you for telling me that. I'll have to look more in to it later. I'm liking it! As sbq92 said, you can make several different themes and pretty much choose what level they go with. 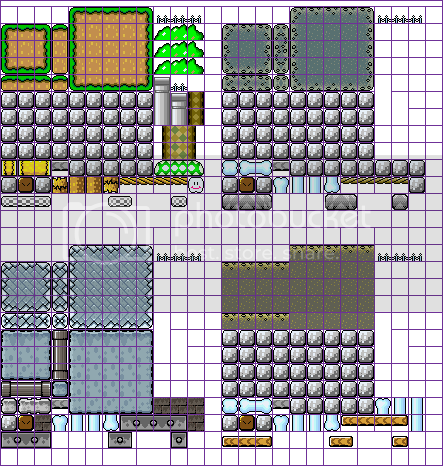 Look at the SMB3 skin already in the game for example, it has well over 8 themes, one for each world, one for castles, one for underground, and one for underwater. There's probably even more than that. You may want to try to get backgrounds for these as well. They pretty much just looped a relatively short picture, but some had two or three pictures it would swap between to animate it. For example, I'm pretty sure haunted houses had the background animate lanterns on the wall. On that note, may I suggest a haunted house theme? As for making the coral bones, I'm pretty sure they don't stack, but rather they animate between those. So how you have those set up might not work. You might ask Ryuza just to check though. Oh and what are the trees are supposed to be? SMW is a tough one to skin, because there's just so much, but you're doing great so far. If you need any help with it just let us know, there's several of us here that like to help out with this type of stuff. Thanks. Now that I know that I can expand it, I'm gonna go all out! sbq92 and silentshadowxp like this. Awesome! Let us know if you need any help putting all of that into the official skin sheets. Are you going to make a map skin as well? Well, I don't know how I'm suppose to put them into the official sheet sense there are so many themes. If I could see an example on what to do, I'd gladly transfer them over. You see how the theme skins have four places? Copy the bottom two, and paste it below everything. I'm pretty sure that's how to set it up for that. I'm pretty sure that would be sufficient, and if it's not right, at least it will all be in one sheet for Ryuza to edit. Thank you! I'll get to it later. I'm actually playing SMC right now. 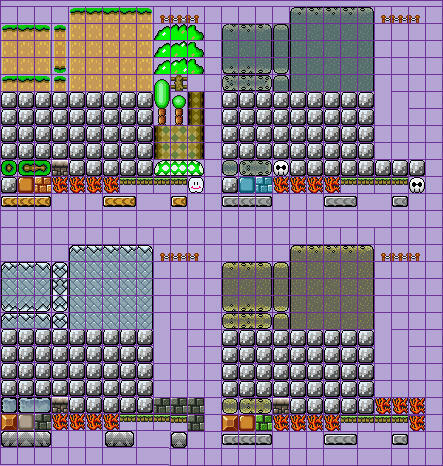 The theme sheets actually go in rows of four, so that SMB SNES theme sheet could (should?) actually be on a single line rather than 2x2. Ah, my bad. I was just guessing based on the example skin they gave us. Didn't know they had said to do it in rows of 4.